I love the Summer months here in Australia where, as part of our culture, Barbecuing is the way to eat. 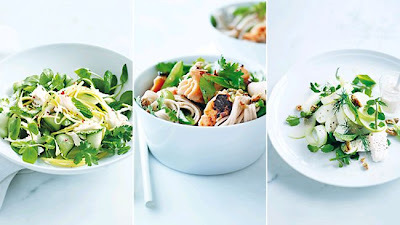 I love grilling fish and then adding this gorgeous Vietnamese Salad which I came across on Goop a couple of years ago. It's so fresh, crunchy and packed with flavour. I usually drop the watercress but give it a go with whatever raw veggies you love! Another great place for simple, healthy and TASTY recipes is Supercharged Foods...try the Shepherd's Pie with Cauliflower Mash...amazing!